This past weekend, two-time Grammy winner Miranda Lambert was giving a concert in Hartford, Connecticut when something she saw in the crowd stopped her in her tracks. Lambert was midway through her 2011 “Song of the Year” hit “The House That Built Me” when she noticed someone in the audience holding a sign. The sign read “3 combat tours… Your voice was the last thing I heard every night. 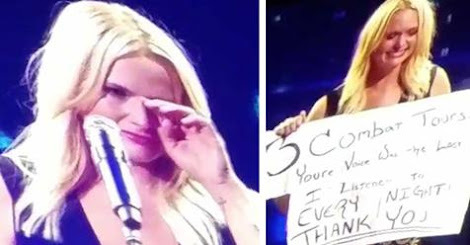 Thank you.” The country music star broke down in tears. A soldier in the crowd was holding the sign; he and his favorite singer were both overwhelmed with emotion when the sign caught her eye, and Lambert had the sign brought up on stage so that she could show the audience. Lambert tried to continue with the concert, but she was overwhelmed with emotion. “I can’t do it!” she says to the audience. “Sing the verse! I gotta get a drink.” The audience applauds for both Lambert and the hero who made her sign, then they mercifully take over the song for her, singing while she nods and wipes her eyes.